A party, just before the summer holiday, was organised at the Third Junior High School of Corinth on June 23.The etwinning team of EUROPE'S ABC OF SUPERFOODS received a very beautiful certificate of participation in our project, which was designed by our gifted Greek teacher Mrs Giannakopoulou.The students, who will be lyceum students next year, also received a gift from our headmistress. Finally, all students danced beautiful folk dances, savoured great homemade food and had a wonderful time dancing. Here are some photos from this unforgettable event. “Our Food Should Be Our Medicine And Our Medicine Should Be Our Food.” - Hippocrates 460 - 370 BC. Commuting, going to school, studying, exercising, socializing-our lives are busy and there simply isn't the time to sustain a super healthy lifestyle. We rarely wake up feeling energised or refreshed. Yet the answer is simple; SUPERFOODS. In the course of this project, we will explore SUPERFOODS and see how we can introduce them into our daily diet through our brilliantly inspiring nutrient-packed recipes. 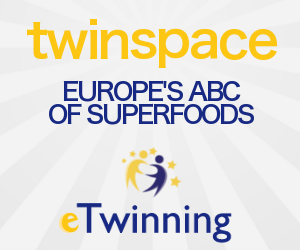 We’ll create etwinning’s original alphabet of SUPERFOODS keeping always in mind that you are what you eat and that a healthy stomach leads to a healthy body and mind, and a better, happier you. Maria Malliou Copyright 2015. Picture Window theme. Theme images by MvH. Powered by Blogger.